***Out Now On Beatport: http://bit.ly/Bpzfdk *** German duo Digitalism are no strangers to crafting stadium-rock electronic anthems, as 2005’s enormous worldwide hit ‘Zdarlight’ proved. Propelling the duo to stratospheric heights and receiving global support, the pair then went on to craft further distinct dance-punk infused winners to mass critical acclaim. 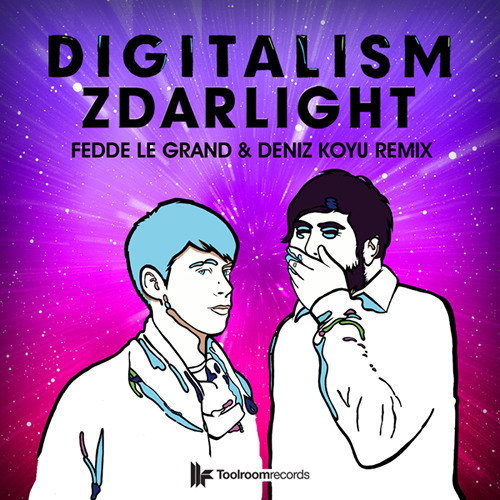 Now Toolroom Records unleashes ‘Zdarlight’, with the lads’ renowned sound being reworked itself by two producers justified enough to take on such a seminal electronic classic: Fedde le Grand & Deniz Koyu. Fedde le Grand is the name that has become synonymous with high-quality huge anthem-esque productions that has seen the Dutchman scoop countless number 1s, remix superstar bands such as Coldplay, and rock out thousands of revelers at parties around the world. Deniz Koyu is the studio wonder kid who has teamed up alongside Fedde to live up to a hot-tipped reputation by the scene’s biggest players as being the next huge dance music superstar in the making. Something this remix does little to disprove. With so much talent combined under one production it’s little wonder ‘Zdarlight’ (Fedde le Grand & Deniz Koyu Remix) has been blowing away thousand-strong crowds, from massive festivals to the world’s biggest super clubs. Mind-blowing production values impress, but it’s le Grand and Koyu’s ability to maintain the cool integrity of the original whilst offering a massive on-trend rework that really keeps the feet on the dance floor. Keep the summer vibes going as the season winds in with this next Toolroom tipped hands-in-the-air hit. Take My Hand And RELOAD!!! Waiting the release guys !! bringing back a smash tune!